Nights Of Unrest, Torched Cars, After Fatal Shooting By Police In Nantes, France The police officer, who shot the motorist at a checkpoint on Tuesday, has changed his story about the circumstances of the incident. On Friday he was charged with manslaughter. A firefighter works to extinguish a burning vehicle in Nantes, France, on Tuesday. Days of unrest have plagued the city after a police officer fatally shot a motorist at a checkpoint. 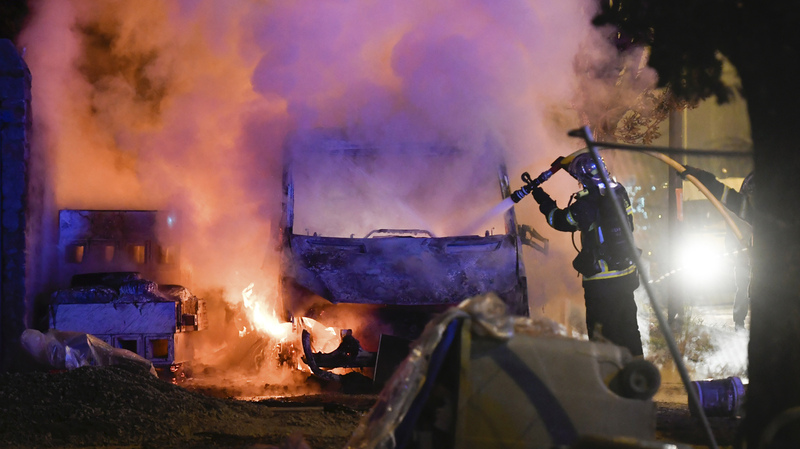 Angry demonstrators have taken to the streets in Nantes, France, some torching cars, shops and public buildings to protest the fatal shooting of a 22-year-old motorist by a police officer at a checkpoint on Tuesday. Several people were detained and the rioting prompted the French prime minister to visit the northwestern city on Thursday and appeal for calm. On Friday, prosecutor Pierre Sennès announced at a news conference that the police officer had been charged with manslaughter. The unnamed officer has been in police custody since Thursday. According to Sennès, the officer has changed his story about what happened on Tuesday. He initially claimed he fired his weapon because he perceived the motorist to be a threat and wanted to protect bystanders in the path of the vehicle. Several of the officers' colleagues had seemed to back up that account, saying the driver had been reversing at high speed, endangering at least two children playing behind the vehicle, reports Le Monde. But in the officer's latest version of events, he said he shot the driver "by accident" while reaching into the vehicle to grab the steering wheel, Sennès said. One witness told Agence France Press that the vehicle was not moving when the officer shot. #Nantes : je condamne de la manière la plus ferme ces agissements et cette violence. Détruire des équipements et s'en prendre aux forces de l'ordre, c'est avant tout nuire au développement de ces quartiers et obscurcir les perspectives de leurs habitants. The motorist has been identified by the single name of Aboubakar. Over the course of the demonstrations, protesters sometimes clashed with police. On Friday, three men were given suspended prison sentences for violence committed against police two days earlier, according to Le Monde. Prime Minister Edouard Philippe, who visited Nantes on Thursday in a bid to ease tensions, expressed support for police and condemned the violence, tweeting that destroying equipment and attacking law enforcement only hurt residents. Not all protesters resorted to violence, however. 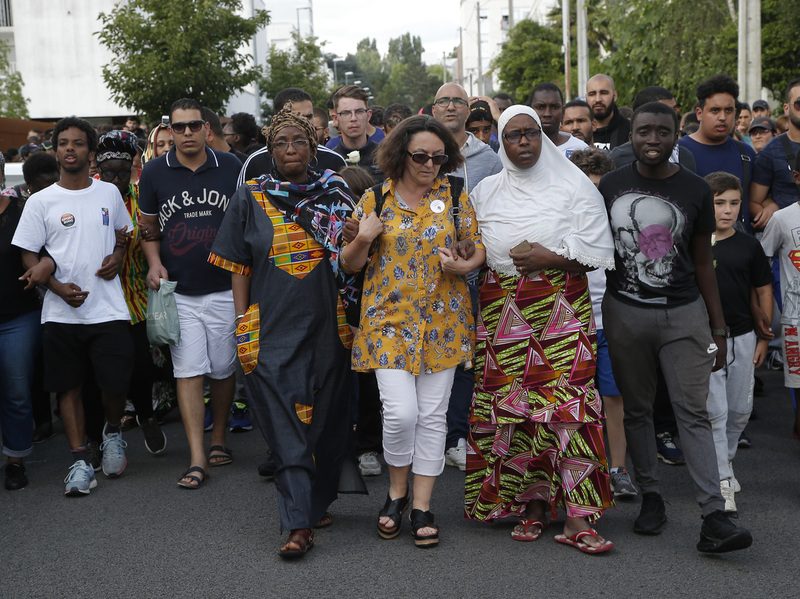 On Thursday, around 1,000 of them, some linking arms, took to the streets, reports BFM TV. People gathered for a silent march Thursday in Nantes to protest the shooting by a police officer. They marched silently, then broke into chants of "Justice for Abou." A makeshift memorial piled high with flowers stood at the place where Aboubakar was shot.